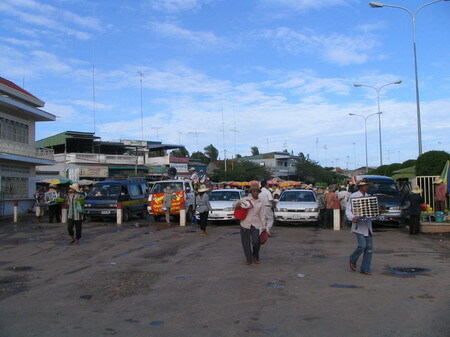 We leave Phnom Penh by car early in the morning, heading east on National Road 1. This road goes all the way to Ho Chi Minh (Saigon) in Vietnam and accordingly it sees massive traffic most of the time. Given that this road connects capitals of countries the governments of which cooperate closely it comes as surprise that one third of the Cambodian part of the road is narrow and broken in many places, more precisely, the stretch between Phnom Penh and Neak Luong at the Mekong. In strong contrast, the same road is wide and in excellent conditions on the other side of the Mekong all the way to the border. 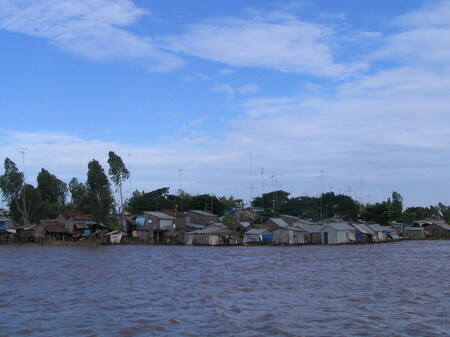 On National Road 1, one can cross the Mekong only by ferry, at Neak Luong (Neak Loeang). 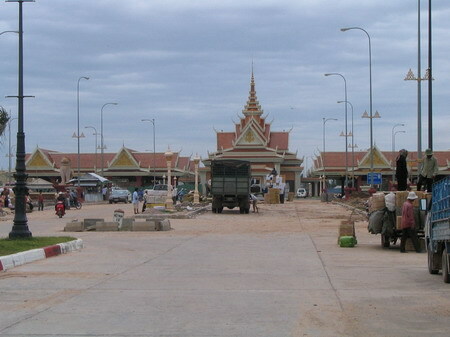 The only bridge in Cambodia that spans the Mekong is the Japanese Friendship Bridge in Kampong Cham. 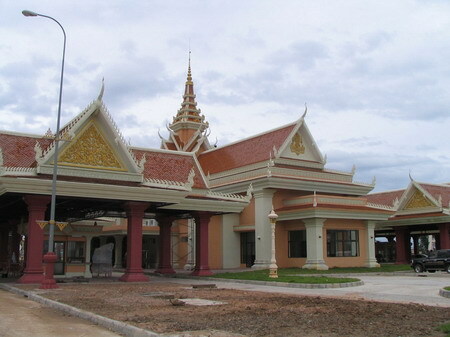 “A key bridge is planned at Neak Luong, on Route 1, about a third of the way from Phnom Penh to Ho Chi Minh City. 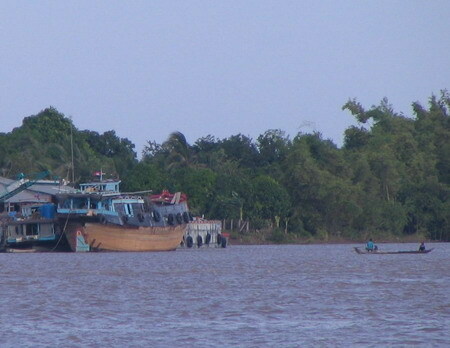 Only a ferry crosses the Mekong here, and only in daytime, causing backlogs of traffic and severely limiting trade with thriving southern Vietnam. 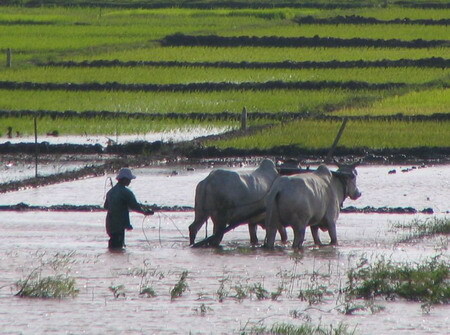 On the way to Neak Luong. My very first trip on a big motorbike was to Neak Luong. 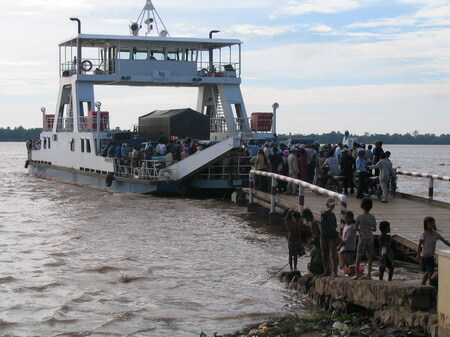 Cars waiting at the ferry in Neak Luong. It is holiday and many people are traveling. A number of mostly ethnic Vietnamese people sell snacks, soft drinks and sun glasses. Interestingly, the name of this ferry is Vishnu. 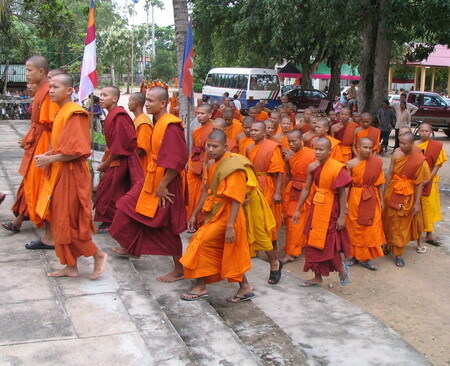 Odd combination again since Buddhism has constitutional status in Cambodia and is the religion of a great majority of the country’s population. As many readers will know, early Cambodian history was strongly influenced by Indian culture and Angkor Wat, the most spectacular monument of Khmer identity and greatness, was originally founded in honor of Visnu. The temple’s ceremonial approach is from the west, probably precisely because of the association of the west with Vishnu. Once we cross the Mekong there is a wide and perfectly even road. After passing the road there are some mountains on the left hand. 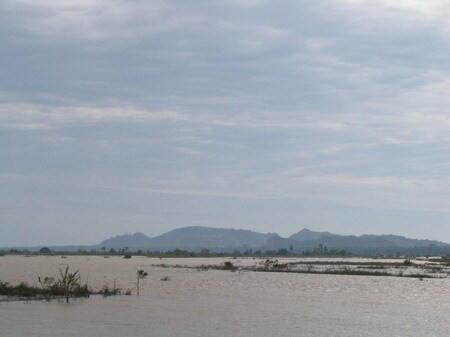 This is the Ba Phnom area. Ba Phnom is one of the earliest religious and cultural sites in the Kingdome of Cambodia, dating back to the 5th century and the time of the mysterious Funan. Shortly before we reach Bavet we stop at a restaurant and have breakfast. Later we continue to the border. We visit two of the casinos at the border. Both are rather crowded. Surveillance cameras are all over the place but taking pictures is forbidden. Hummer SUV parked in front of the casino. 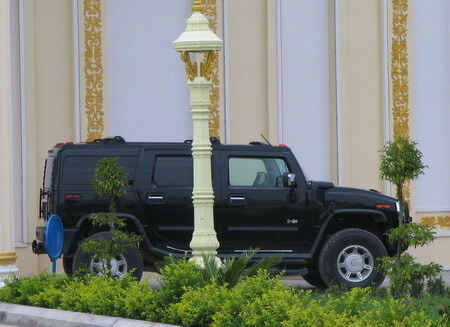 This vehicle is popular among Cambodia’s rich and powerful and their spoiled offspring. Later we visit the border crossing. Impressive buildings are under construction or were recently completed on both sides. As many readers will know, this border line is highly controversial among Cambodians. For many centuries, the Mekong Delta on the other side of the border has been part of Cambodia’s territory and many ethnic Khmer form now a national minority in this area which now is in Vietnam. Discussion about the legitimacy of this border and its demarcation has a central place in contemporary Cambodian politics. 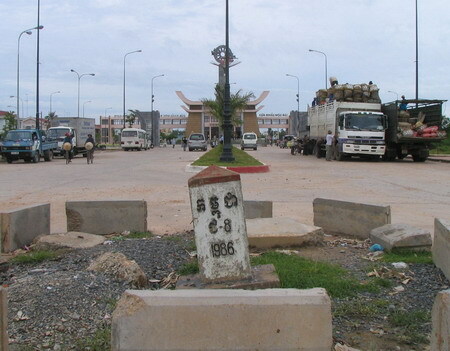 The current border is based on a treaty that PM Hun Sen signed in 1985 when Cambodia was under Vietnamese occupation. 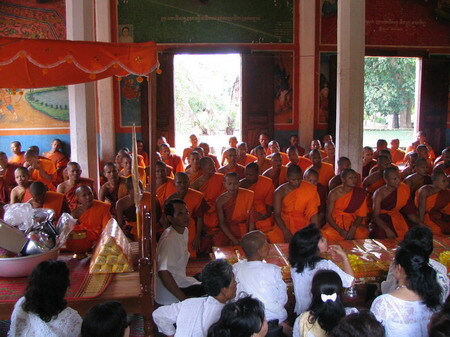 Few weeks ago a new border treaty has been signed by both governments to confirm the status of this border, under fierce protest of the Cambodian opposition that led to a number of high profile arrests and international attention. The architecture of buildings on both sides of the border is strongly informed by respective national traditions and contrast strongly with each other. Moreover, they seem too large to only house checkpoint facilities. Rather, these buildings appear to be deliberate monuments of national identity and statements of national ownership. 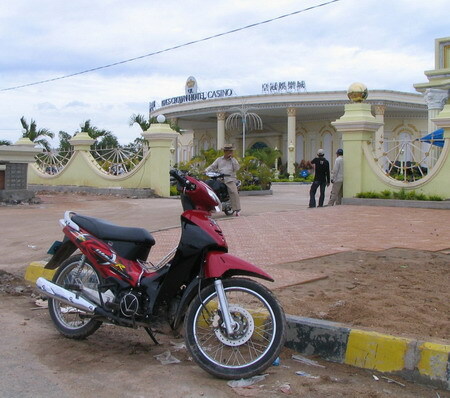 Cambodian side of the border. 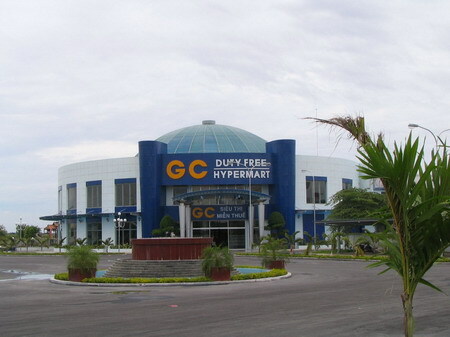 A modern supermarket has been built but has no opened yet. 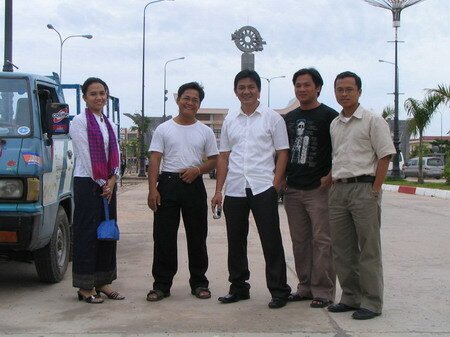 From left to right: Maly, Phal, Dara, a friend of my colleagues whose name I forgot and Samnang. 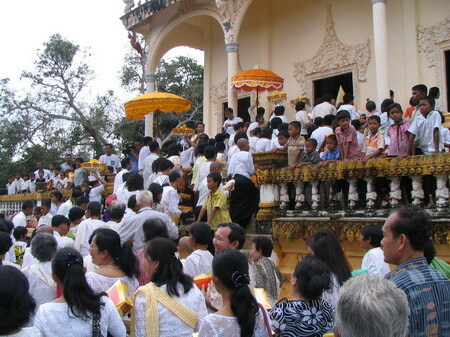 From here we drive to the wat to join the Pchum Ben celebration, which takes place on the 15th day of the waxing moon during the tenth month of the Khmer calendar. It lasts 15 days, each of which is called a day of Kan Ben. A Ben is an offering. 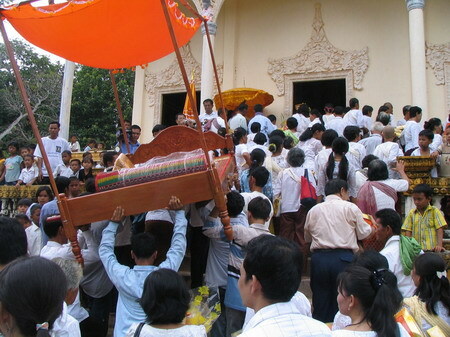 The final day of Pchum Ben is the most important for all followers. 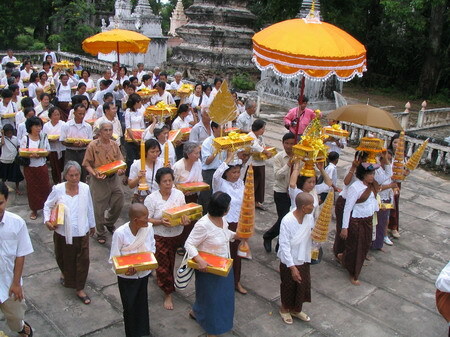 On this day, the rich as well as the poor prepare food and other offerings for a visit to the pagoda. 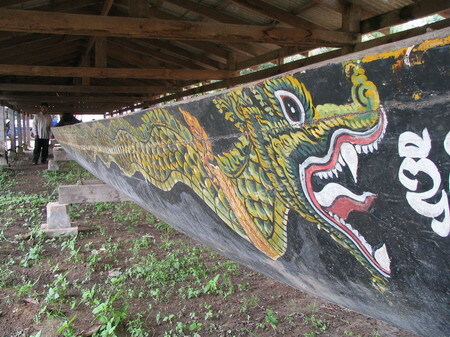 In wats across the county, collections of offerings are dedicated to the souls of ancestors. If this duty is ignored, believes hold that the soul is cursed and will haunt the neglectful descendents for the rest of the year. 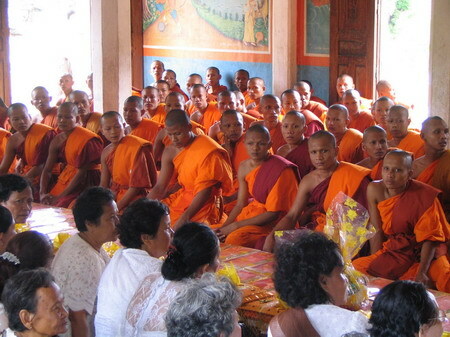 Money raised among Buddhist followers and offered to monks on this occasion goes towards new robes for the monks, the construction or renovation of temples and community developments such as the construction of bridges and schools. 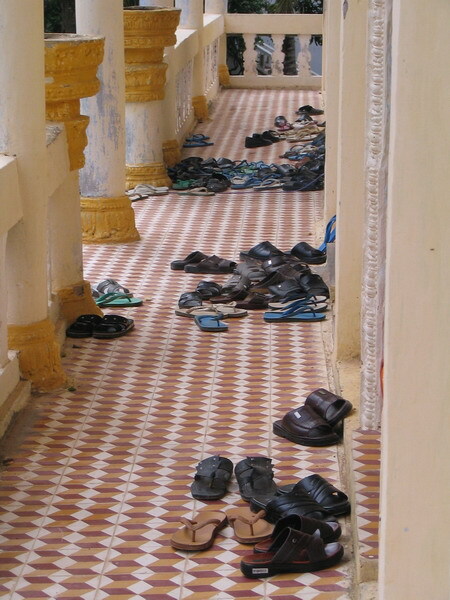 This is outside the temple. 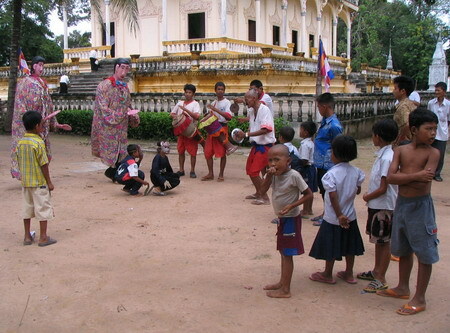 Musicians play drums and two dressed-up men dance, to the amusements of a bunch of children. 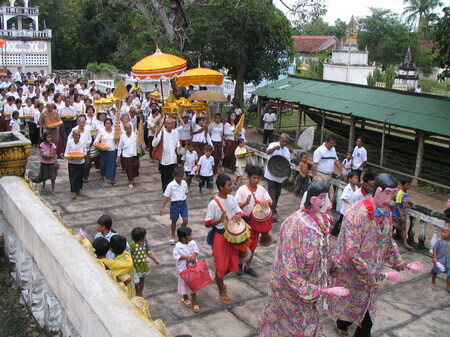 People get ready for the ceremonial walks around the temple. 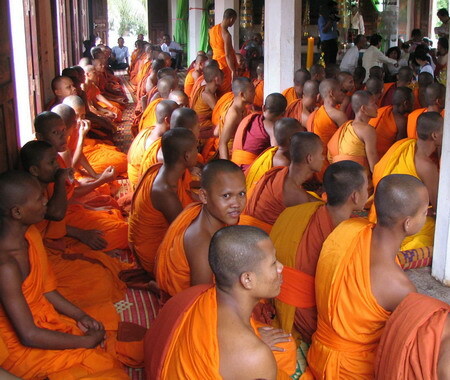 Women in particular are dressed in beautiful traditional cloths. A new bed is among the offerings. Inside the temple. 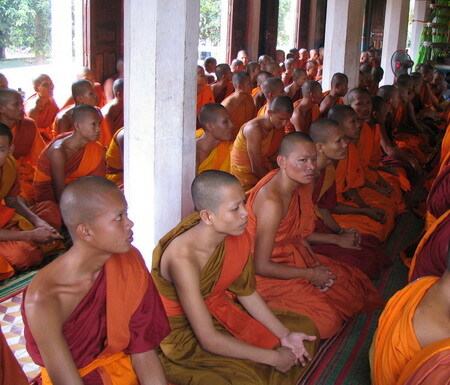 The monks are sitting in one half of the room, facing other people sitting in the opposite half of it. Both are separated by the offerings that include a wall of paper cartons containing new robes. After some time we leave and drive back to Phnom Penh. 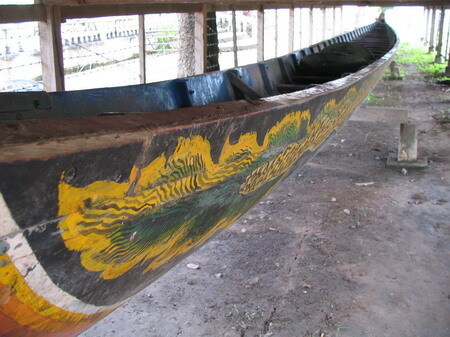 Long wooden boat outside the temple on the grounds of the pagoda. if can please reply back by my mail below. Thank you very much, God bless you ! a very nice photo shots! nice places you just visited. can you tell me . what do you do? why you went there? Hi! 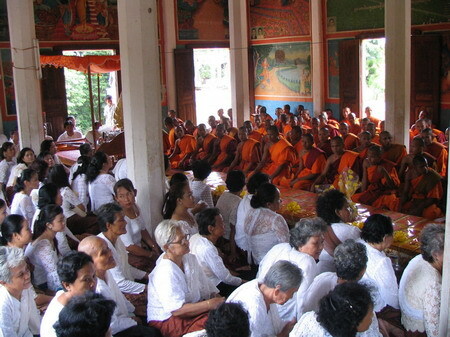 After looking and reading, I feel that you are really interested in Cambodians’ activities during Pchum Ben day. It seems a first time for you to travel to the province. Anyway, the pictures you took are nice. I like them. If possible, I just want to ask you some questions. 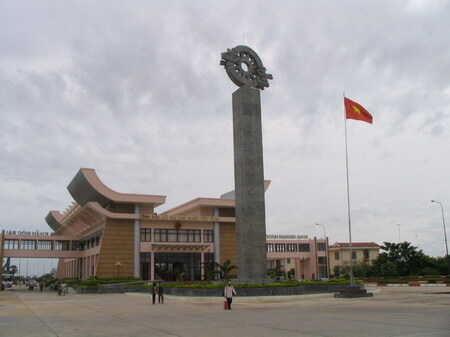 Why did you choose Svay Rieng Province for your trip? Thanks you very much for kindly sharing your experiences. 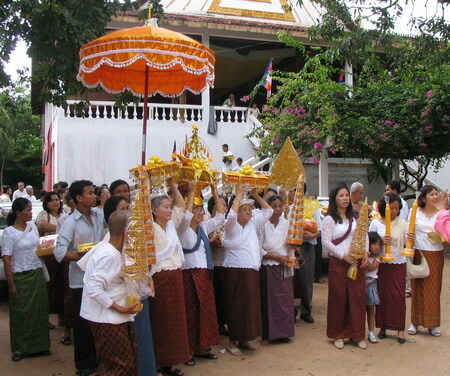 Good luck for Pchum Ben day. Thanks for being a Awesome Cambodian and share such a great things for us.